My daughter's weekly first grade spelling lists typically contain fairly ordinary words. Often the lists focus on word families or include frequently used words. Normally my daughter breezes through the lists without much difficulty. 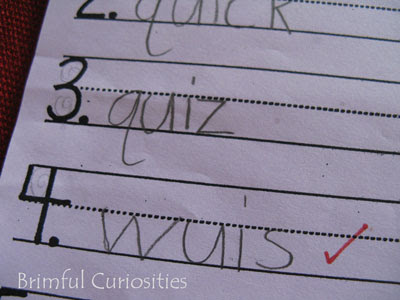 However, last week during the pre-test, she struggled with the word "whiz." What a strange word! I can't recall the last time I used the term myself, and I'm sure that previously to the test, it was not a word in her own personal vocabulary. At least she made a gallant effort to spell the word phonetically. Then, lo and behold, this weekend my daughter read aloud Cynthia Rylant's The Case of the Baffled Bear from The High-Rise Private Eyes series. Ironically, this wacky spelling word appears on page 21! "I've seen you guys whiz through town on your bikes," said Bunny. Perhaps the term is used more often than I thought. Whatever the case, my daughter now has the word down pat and is on her way to becoming a true spelling whiz! Do you have any unusual spelling word stories to relate? Please do tell! Ha! I can't remember the last time I heard that word! Lol isn't it funny to see them spell things as they sound? I hadn't really thought about it - but you can bet I'll be keeping an eye out for it in stories from now on! Funny, I use the word "whiz" fairly often! Your daughter's effort was excellent with a word so unfamiliar to her. Cute post! I have a little spelling whiz at home, too. She gets stumped every once in awhile by a strange word like this one. I use it foe "pee." I swear that English is the most challenging language ever. It's just a series of contradictions in rules! We discussed that very word this morning in our Word Warrior (fancy name for a Scrabble & Bananagrams type library club). They were 3rd graders and did not recognize the term. So no worries! PS I will not say how many years later I still shudder at the word that got me kicked out of the eighth grade spelling bee. I knew EVERY SINGLE WORD AFTER ... and yet in my nerves I spelled out "M-O-N-K-E-E." You can tell this was before satellite cable, no? Good ol' Nick re-run days.